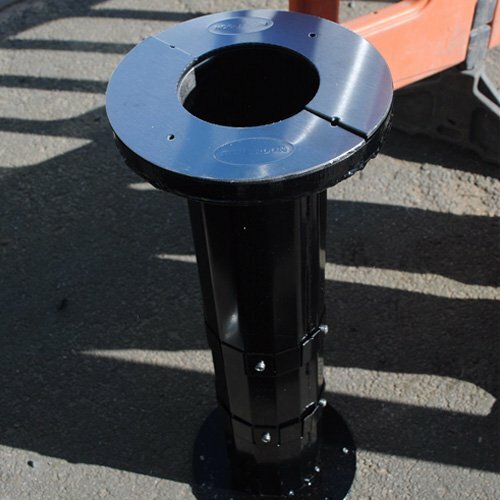 The Atlas Retention Socket is a secure foundation system that makes it easy to remove and replace a column without excavation. The Atlas securely holds poles in place i.e. a lighting column or a traffic signal post. 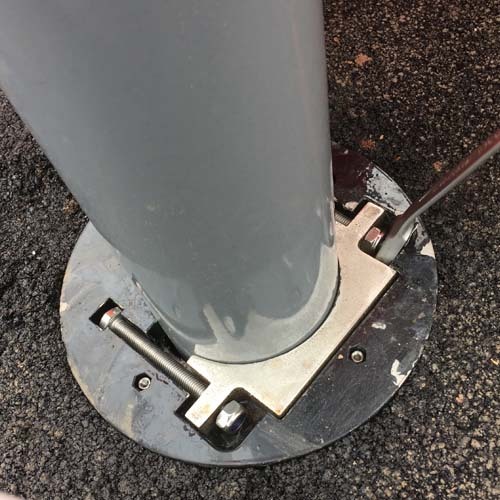 The superior grip of the Atlas clamp prevents pole rotation in high wind locations, making the Atlas socket the strongest gripping socket on the market. Tested to a torque of 1.42 kNm. 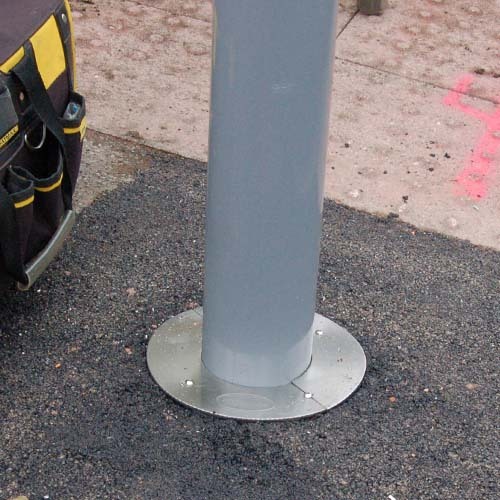 The Atlas Retention Socket, manufactured out of stainless steel, is designed to remain in the ground undamaged following a knockdown of the pole. The ease and speed of replacement that the Atlas provides drastically reduces maintenance and keeps traffic flowing. 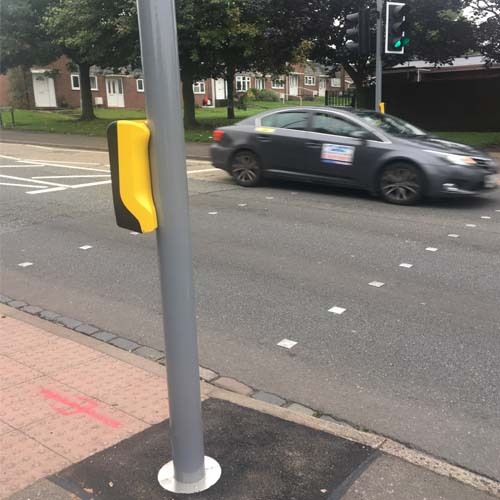 A traffic signal installed using the Atlas Retention Socket is easier to replace following the knock down of the pole and contributes to reduce downtime in busy traffic signal junctions. Uniform gripping action. High strength grip (1.42 kNm). Clamping system won’t pierce or damage your post. Aesthetic design with attractive top cover. Circular design suitable for rapid, core excavation. Very quick replacement of poles and columns. Sweeping bend duct for easy feeding of SWA cables. Replaceable clamp and brushed stainless steel top cover. 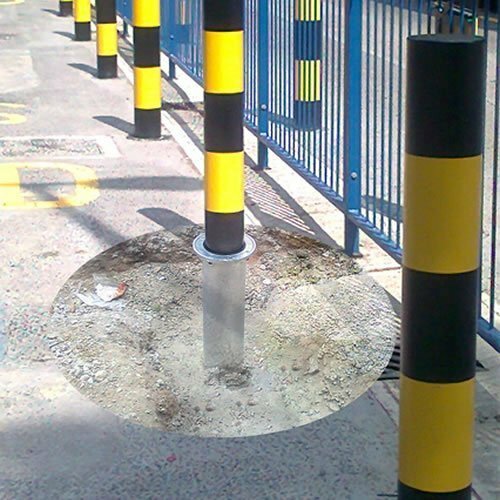 Saves repair costs and minimises traffic disruption. Protects pole and column integrity, increasing service life. 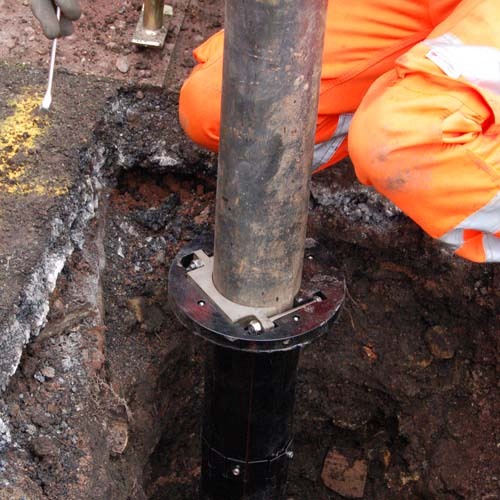 The Atlas Retention Socket features a strong clamping mechanism able to securely hold the pole in place. The clamping mechanism features uniform gripping and will not pierce or damage the pole. This is of particular benefit with passively safe products made from softer materials such as aluminium or composite plastic. 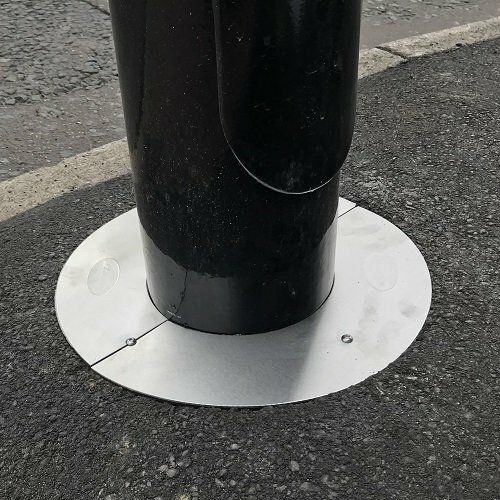 The design of this retention socket also features an aesthetic improvement as its mechanism is more compact than other side-locking mechanisms and the stainless steel, decorative top covers can complement more attractive street designs. The stainless steel top covers in brushed stainless steel provide a smart look. We’ll be happy to discuss your project needs. As manufacturers, we’re able to accommodate any customisations that may be required. Ritherdon products are manufactured in-house and made in Britain. This allows the post planting depth of the Socket to be increased to 600mm, 750mm, 900mm, 1050mm, 1200mm and so on. Extension pieces can also be made any size to suit specific requirements, call us to discuss! 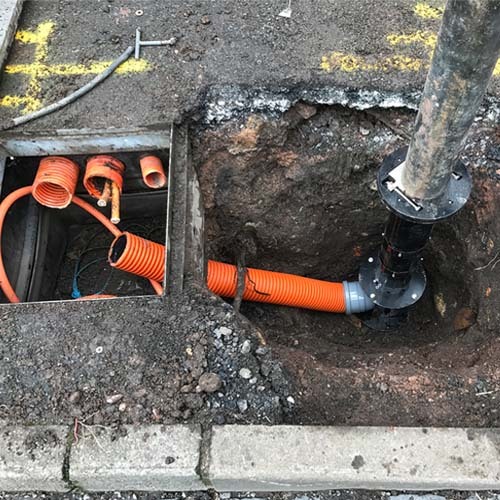 The Atlas Retention Socket may be used in combination with the IP68 Poleplug system to make both the column and electrical/data reinstatement as fast and as easy as possible. 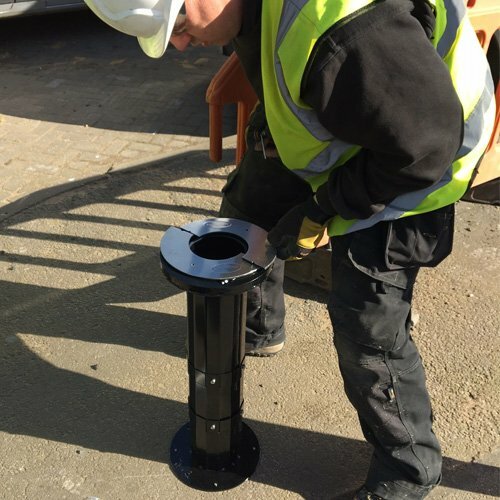 This saves time on site following an accident: reducing cost and improving contractor safety. The Atlas Socket is fabricated using Stainless Steel grade 1.4003. This is a utility ferritic stainless steel. It was chosen because it offers the benefits of more highly alloyed stainless steels such as strength, corrosion and abrasion resistance, durability and low maintenance (See more properties of stainless steel). In addition, type 1.4003 is weldable and formable allowing it to be fabricated using conventional techniques and is perfect for this application. The socket is powder coated for added durability with no need to galvanise. Therefore there is no need to add extra thickness to withstand the galvanising process. The result is a lightweight product that is easy to handle on site and during installation. For Non-Illuminated and Illuminated Applications. Available Duct Foot connector or as a Tee entry connector. The sweeping bend duct connector makes it very easy to feed SWA cable into the retention socket. Like the standard duct connector, the sweeping bend is fully rotatable. The base plate at the foot of the bend stabilises the socket during installation. The sweeping bend made this installation in Scotland easier. Download a PDF Data Sheet for the Atlas Retention Socket and head to our Technical Information for more specific product information, including Atlas test reports. If you would like more information please make an enquiry below.